For the basic SSL/TLS Certificate, New Users Might Get Confused and Face Error. The commonest error which is faced by SSL Labs Test is Chain issues – Incomplete error. Usually it results in ” Grade capped to B.” Here is Nginx SSL Certificate Incomplete Chain Issues Fix Guide. GeoTrust and Thawte actually sends all the needed stuffs. Usually for Quick SSL Certificates, the server certificate is send via email, you need to download the bundle certificate. It can happen to any SSL/TLS Certificate due to wrong method used in implementation. We have many SSL/TLS Certificate installation guides, if you followed our’s guide, it would difficult to take place ever. 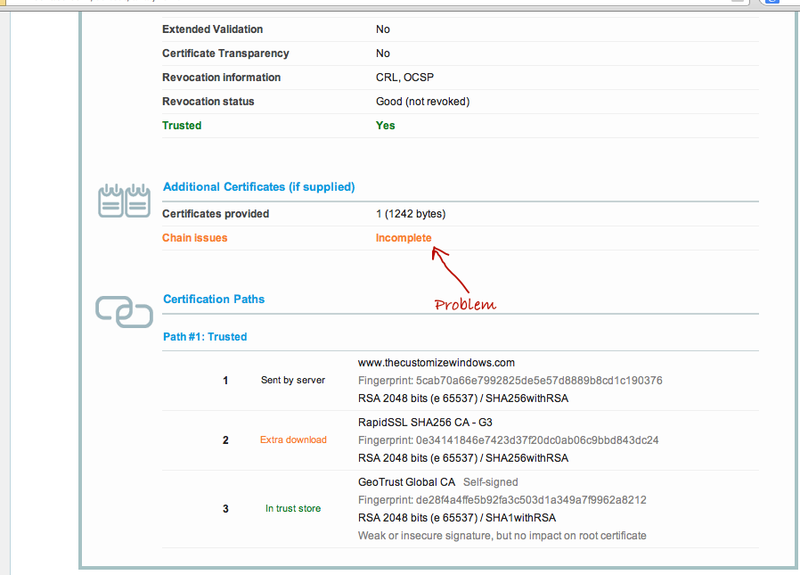 The trusted root certificate should not be there, as it is already included in the system™s root certificate store. You do not need to think about it. Copy paste that to any text editor. These are expired examples, do not paste your domain’s cert on Question-Answer forums. Second two or made to one are publicly available, but the first one is kind of Love Letter – secret. For Nginx saving it with nginx.crt makes one certificate. Another is your key which is not relevant here. This process of making together is called concatenation. On OS X or GNU/Linux desktop, if you copy paste on GUI, it will work fine. People says to use the cat as who will copy and paste on Microsoft Word, difficult to predict. It is very easy to use, you need not manually hunt your all the intermediate CA certificates and copy paste them. If you only have the server’s certificate, it will work fine. It can be difficult to use by a new user but basically it is most easy. Contains anchor error means you have added the root certificate too. That was wrong. When you will get error; create a named directory and freshly create the file like written above. This Article Has Been Shared 6012 Times! Robot Pet AIBO was a commercial production from Sony which has been out of production since 2006. What made AIBO to stand out from the Robot Pet crowd ? Model-View-Controller or MVC is an architectural pattern for structuring software development in the three units of architecture patterns. What is JSON and How it Works? Cite this article as: Abhishek Ghosh, "Nginx SSL Certificate Incomplete Chain Issues Fix," in The Customize Windows, May 5, 2015, April 21, 2019, https://thecustomizewindows.com/2015/05/nginx-ssl-certificate-incomplete-chain-issues-fix/.